E-democracy has become a vital component of Canada’s vision for open government. Engaging citizens with the help of digital media is a pillar of the federal government’s Open Government Action Plan. The plan itself is a cluster of commitments presented to the Open Government Partnership (OGP), an international initiative with the mandate to improve transparency, accountability, and citizen engagement in countries internationally using digital media. Canada has been participating in the OGP since 2011. It released its first action plan in 2012 and the second action plan was released November 6, 2014 after a lengthy consultation process that took place both on and offline. This new plan followed on the heels of an independent assessment written by myself and released by the OGP’s Independent Reporting Mechanism (IRM). 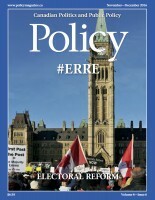 What follows is a very brief overview of Canada’s progress, and in some cases failure, in the area of open government. While the focus certainly goes beyond e-democracy, it is argued that improved e-democracy will allow Canada to move forward with a stronger and more successful open government agenda that better reflects the concerns and needs of Canadians. The IRM is built into the OGP system as a part of a system of checks and balances on government. It has an independent researcher in each of its member countries to report on the progress that their governments are making in keeping their open government commitments and to assess things like the ambitiousness of the commitments. Governments must agree to this independent review process as part of their membership. My first IRM assessment report was published in February 2014 and the data collection for the next report will start in the fall of 2015. One of the main conclusions from the first report was that the government had made good headway in completing a majority of the commitments outlined in its first action plan, but that the plan itself needed to be more ambitious and did not adequately address some of the fundamental problems that were identified by participants in my own research which included things like our antiquated access to information legislation, and issues related to data collection, or lack of data collection. It was also built on a process of online citizen consultation that was weak at best. One of the reasons that people felt our first plan was not ambitious was because there is a feeling that Canada started in a position of privilege and that to be a leader in the area we needed to develop ambitious goals with the potential to affect real change. This is an important point and one I think is worth reflecting on. Canada joined into the OGP with a much stronger foundation for open government than many of the other countries that have become, or might want to become, members. We have access to information legislation. The access regime is fraught with problems that have been widely and frequently documented, but we have something to work with. We have an active and visible Information Commissioner who has sought public input on how to strengthen the system and who has made a point of feeding into the open government consultations on her own accord. Other countries have struggled to develop basic access to information legislation and have no clear information champion. We have policies relating to things like proactive disclosure?policies related to record keeping and to accessibility. We have an open data portal. We have a free press that helps to hold government to account and pushes for openness. Again, that isn’t to say that these things could be improved, but we have them. There is something to work with. We have stability. We might lose sight of this at times, but many of the other OGP countries have faced multiple regime changes, civil unrest and a public service that is virtually unrecognizable from day to day. When we step back and reflect on these sorts of points we remember how lucky we are. That said, many things have happened since the development of our access to information legislation and policies around disclosure that have compromised openness in Canada, such as the many reports on the state of access to information, the treatment of scientists, the state of libraries, and the effects of the cancelation of the mandatory long form census that have been starting to surface. I could go on, but really these examples highlight the fact that ambition and action are required if we want to be able to call ourselves a leader in the area of open government. This is not easy. Making any sort of change that will have a transformative impact requires high-level support. It also requires tackling a number of challenges head on. Changing the culture within the public service, for example, is an enormous challenge. The existing hierarchical nature of, what at least from an outsider’s perspective, seems to be overly complicated chains of approval processes and limited autonomy for the individual is not conducive to openness, but changing attitudes and habits will not happen overnight. The multi-jurisdictional make-up of Canada is another challenge. While commitments to the OGP are entered into by the federal government, open government itself is not solely a federal issue. And, there are many more innovative things happening at other levels of government. Coordinating and learning from one another so that openness can be experienced across the country regardless of level of government will help moving forward. In designing any sort of strategy for change one has to think about what a Canadian solution or plan should look like. There is certainly pressure from the international environment to initiate change, but the design and implementation needs to be done is such a way that it does not compromise some of Canada’s unique characteristics, including characteristics like multiculturalism and bilingualism. Finally, two additional challenges that need to be overcome include a lack of awareness about the OGP, and a relatively weak or uncoordinated civil society presence. Moving forward, responsibility rests not only with government, but also with civil society, and with Canadians much more widely. Civil society needs to co-ordinate more fully and to have more of a public voice. This will help to hold the government to account for the contents of its action plans and will also help to raise awareness about open government and the OGP. The federal government also needs to do more to raise awareness about its commitments and membership in the OGP. Our membership in the OGP is important. It gives Canadians power to ensure that open government is not a passing trendy item on the political agenda. Canada is responding to a commitment that it made internationally. That commitment can help to keep open government at the forefront of the minds of policy makers regardless of which party might be governing. Those who are, or want to be, involved in open government need to identify ways to draw on each other’s experience and expertise so that open government becomes a more collaborative endeavor. During the course of my IRM review I encountered people who wanted to vent their frustration at the current government over information and communication practices that are widely perceived as closed and highly controlled. They were upset. They had reason to be upset and the reaction was not necessarily unanticipated. I am sympathetic to these sorts of reactions. They are human and they show that people care about what has been going on in the country. In a sense they are encouraging. On another level we need to get past that sort of reaction and move on to a conversation that is more constructive. Where potential solutions and suggestions for change are offered and explored in greater depth. I was lucky to have people participate in my study from across the country who helped me to start this process. But the sort of collaborative relationship that I am suggesting needs to go further and the relationship between government and civil society needs to be strengthened, or, some might say, repaired. We can see different models of this unfolding in other countries. Some, for example, have included a message from civil society in their action plans and have clearly indicated relevant civil society partners for each commitment in their plans. Others have embraced the IRM reports in a much more public way. These may not be the models we want to adopt, but they do show ways were expertise is shared, considered and responded to and where there is collective ownership over the open government agenda. The government needs to treat information like the valuable resource that it is. Decisions to change the way that information is collected or not collected; analyzed or not analyzed; presented to the public or not presented to the public, are not decisions that are temporally bound. They are decisions that have long term consequences for things like evidence based policy development, for the health of the economy, and the preservation of our identity and culture. It is only by working together that we can ensure this resource is protected. The sort of collaborative relationship I outline here is complicated by many factors, one of which is geography. Any national plan for open government should be reflective of Canadians across the country. Coordinating and seeking input across such a distance is difficult. Here, digital media has an important role to play as a supplement to other forms of engagement. Online tools will be vital in coordinating civil society and strengthening the relationship between Canadians and government. As e-democracy improves, the potential for a better open government, and more ambitious open government action plans increases. Mary Francoli is an Associate Professor of Communication Studies at Carleton University’s School of Journalism and Communication. She is also the current Canadian national researcher for the Open Government Partnership’s Independent Reporting Mechanism.Mary received her PhD in Political Science from The University of Western Ontario in 2005. She is interested in the impact of new media on governance, the state and society. Her research is largely focused on how new forms of e-participation affect the relationship between citizens and government. The Centre for e-Democracy is a registered charity. Tax receipts will be issued for donations over $20. Keep up to date with the latest news. By: Nicole Goodman From October 18 to 21 I had the pleasure of attending the EVOTE-ID conference in Bregenz, Austria which focuses on election technologies. Get The Latest News On e-Democracy. By subscribing you are providing consent to receive e-mail updates from the Centre for e-Democracy. You may unsubscribe at any time.